How similar – or different – can two bus trips, taken on the same day but on two continents, be? As part of our Parallel Worlds writing project, we hopped on commuter buses at the same time of day, but five hours and 6,061km apart, and recorded the ride. This is the story of our journeys – one in Cape Town, and the other in Rio de Janeiro. 8.12am. Fifty-five people, maybe 60, on the bus into Cape Town. We’re a muddle of histories – our mornings a craziness of kettles, alarm clocks, cologne, cupboards, keys and kisses – and for 40 minutes, our separate worlds melt into a single bus ride of calm. A transition. A journey into the city. One man’s on the phone, trying to close a business deal. Needs documents urgently, he says with too much patience. Someone else recites a phone number. There’s a man in a suit, no tie and with a bottle of water in his briefcase. A blonde woman, 20-something, hair straightened and eyes dripping with mascara, sits behind a voluptuous woman with wonderful curls and oversized sunglasses. Most people are on their phones – listening to music; texting friends; reading the news. Into the quiet, music oozes from someone’s earphones. Between bodies there is a mingling of perfume; yet within most minds there is a conscious effort to remain isolated. People caught up in their own worlds. A man close to retirement and with a severe comb-over sits nearby. He looks at me curiously. “What’s this woman doing, standing on the bus and trying furiously to write in her notebook?” I’m sure he’s thinking. My thoughts? When this man was my age, he probably caught a comfortable bus that was for “whites only”; now he’s sitting next to a bored black man wearing rather large earphones who would have voted for the very first time in 1994. Such a contrast of histories, here in this small space. We glide past rush-hour traffic; our bus in its dedicated red concrete lane. All the way into Cape Town, a tar bicycle path will flirt with the strip of indigenous garden that edges this lane. Ristios, wild irises, gazanias, agapanthus. On our left, which is really east, and just past the stand-still of cars, a carpet of reeds dissolves into Flamingo Vlei; pelicans huddle on a patch of sand. The sun’s about an hour above the Durbanville hills, and its light mottles a white path across ripples of dark water. If we were here an hour earlier, we’d have seen, on the other side of the road and across the bay, the sun’s first rays touching the top of Table Mountain. A middle-aged man sits with his legs crossed, showing a strip of hairy shin between a pale sock and dark blue trousers. On the floor stand pointy shoes, leather shoes, sneakers, sandals. Jeans and hoodies are common. A daypack, sunglasses, phone and earphones are almost every commuter’s accessories. Nobody reads a book. Halfway down the bus, a woman’s laughter pitches above the drone of the engine; her hips slinking down through a pencil skirt and into a pair of navy blue heels. On our left, the vlei ends at a cluster of houses painted the same neutral colour; on our right, a lagoon meets the cultivated fairways of a golf course. Cormorants, ducks and gulls revel in the morning sun. It’s hard to beat views as lovely as the first half of the commute from Tableview into Cape Town. But my favourite part of this journey begins where evocative station names like “Sunset Beach”, “Woodbridge Island” and “Lagoon Beach” end, and the route becomes punctuated with the very gritty “Zoarvlei”, “Section”, “Paarden Eiland” and “Vrystaat”. It’s here that the bus lane takes commuters behind industrial buildings, past bricked-up windows and corridors of rusty containers. There is no pretence in this part of the city. There are concrete walls fringed with cruel loops of barbed wire fencing; towers of oil drums; red bricks; piles of wooden pallets; the working end of air-con systems; generators; iron walls; broken trailers; concrete mixers. The buildings are well-used; the colours rich; grimy. Deep, real rust; warm sky blue; dirty white; faded orange. It’s a hard-edged, working part of the city – and there is beauty in that honesty. As we rise with a system of bridges, red cranes on our right mark the harbour and a plantation of bare masts defines the Royal Cape Yacht Club. On our left, the mountain side, an intricate weave of railway lines slides trains into the city; Table Mountain is so close that we can’t see its top. 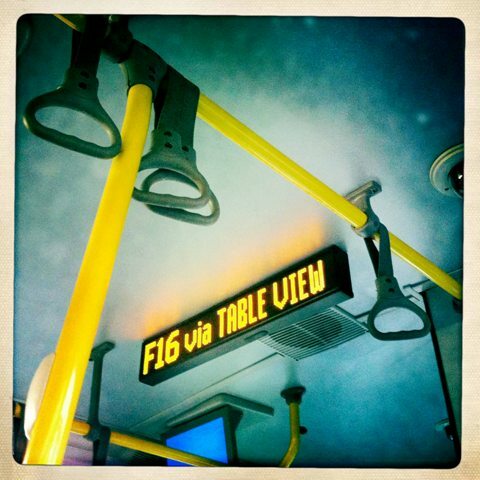 On our bus, people wallow in their thoughts; preparing for their day. Some start to fidget, zip up bags, slip phones into pockets: our journey is coming to an end. Without much fuss, the bus lane integrates itself into the city’s roads and we pull up to the Civic Centre station. Everybody spills out and scatters; our shared journey, the unintentional mingling of our lives – unnoticed by most – is over. There is a working day ahead of us; the transition is complete. An old lady sits by the side of the road on an upturned box. She is selling coffee – in little thimble-sized plastic cups – to commuters who are waiting for the bus in Rio de Janeiro’s Lapa quarter. The cups are essentially shot glasses. This is fitting, since the old lady’s coffee is a syrupy sweet caffeine bomb. A squeal of brakes announces the arrival of the 8:30 bus to Leblon via Ipanema. An old man staggers up to me as I head for the steps. His clothes are in rags and he is grimy from nights on the streets. “Tudo bom?” he smiles toothlessly – all OK? “Tudo bem,” I smile back – all good. He holds out an unsteady hand so we can exchange a high-five and I can tell from his breath that his morning tipple was even more potent than mine. The bus is cram-packed at this hour of the morning. Standing room only. My fellow passengers seem to be shop-tenders and office-workers. The odd student sits here and there clutching satchels. 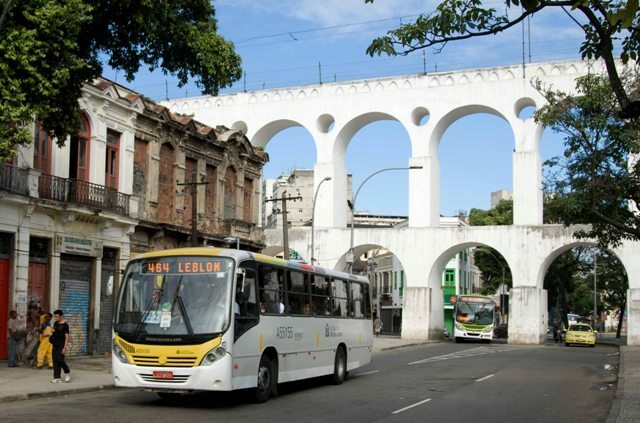 We leave Lapa’s famous white-arched viaduct behind and are soon in the backstreets of Catete. The eateries along the road are already busy with people booting their own day into action with cafezinho shots and little doughy pão de queijo cheese-balls that are the breakfast of choice around here. Within 15 minutes the bus has turned into the harsh sunlight of Flamengo beach and that unforgettable Rio skyline reveals itself. To my left I can see the first of the day’s cable-cars making its journey between Urca peak and Pão de Açucar. Turning away from the beach again we drive into an avenue lined with grand old colonial buildings. But Rio is always a city with two stories, and above us I can see the ramshackle jumble of the favelas (slums) set into the jungle-clad hills of Tijuca National Park. At the very end of the road, perched on his Corcovado crows-nest, the statue of Christ the Redeemer gleams white under the early sun. It’s still only 9am but the mercury is already hitting 31°C. The driver swings hard right by the big cemetery on Morro São João and threads his vehicle briefly into the shadows of Velho tunnel before rattling out into the hallowed light of Copacabana. This was once the place that all Brazilians – and a great number of foreign singers and movie stars – aspired to. A few years ago Copacabana was a notorious crime zone but the favelas around here have been pacified in the last couple of years and the quarter is once again considered so desirable that property prices are said to have tripled in the last three years. Our road runs a couple of blocks back from the waterfront but through gaps in the buildings I can see down the concrete canyons of residential blocks to the sunlight on one of the world’s most famous beaches. Rio’s Zona Sul (southern zone) is really just a series of little villages divided by water and hills. As we emerge from another tunnel we get our first view of the unmistakable twin peaks of Dois Irmãos (the two brothers) and, behind that, the great granite tabletop of Pedra da Gávea. We are now in Ipanema, on yet another waterfront. There is almost nowhere in Rio from where Christ the Redeemer is not visible and as the bus swings to the right I can see him again, looming over Rodrigo de Freitas lagoon. The bus will continue to the end of the lagoon and chic Leblon but my stop is here, next to an ancient banyan tree. In Asia this tangle of snaking roots and looping vines would surely be considered sacred and even here it seems to inspire a sort of reverence. Rio is still a jungle city and the orchids and bromeliads that invade its tree-lined avenues remind Cariocas that back up in the hills on the other side of the lagoon the rainforest is waiting to claim back even blessed Ipanema. I dash with the other commuters across six lanes of bleating traffic and head into the shady boulevard of Vinicius de Morais. Two blocks before the beachfront I gulp down an icy glass of passion-fruit juice at Cantinho de Ipanema. At a sidewalk table, I pull out my laptop to get down to some writing, fueled by my second cafezinho of the morning. This coffee is three times as weak and three times the price, but I am happy to be in Ipanema on another workaday Rio de Janeiro morning. My two dream cities!! This was beautifully written, thank you! Thank you – was a fun writing project to work on. Glad you enjoyed it! Great idea, guys! Loved these pieces. Would love to see a series of these – different forms of transport? Different times? And would love more pics! Would be really interesting to do it with different modes transport. It’s been ages since we wrote real Parallel Worlds piece… hope to have one coming up soon!